Need Tickets? Jump straight to ticket listings with tickets from eBay, StubHub and +100 other sites all listed in one place for comparison shopping and the best deals! The second act of the 2011 World Series featuring the American League Champion Texas Rangers and National League Champion St. Louis Cardinals will take place in the Gateway City’s Busch Stadium on Thursday, October 20. The first two games may feel like more of a Winter Classic than a Fall one, with rain and gametime temperatures in the 30s for Game 1 and plenty of wind forecasted for World Series Game 2, but compelling matchups about and are sure to keep the competition heated. The Rangers are trying to take advantage of their second straight World Series visit in hopes of winning their first championship while the Cardinals are in search of their eleventh title. The histories of these two teams are far from even, but the clubs’ performances this season reveal some interesting similarities that are sure to combine with the weather and fiery fan bases to keep this series interesting. Looking for World Series Tickets? See below! These clubs have only ever met in a series once, back in 2004’s interleague exchange, so there’s very little historical reference. Matchups between specific hitters and pitchers, even in this free agent era of player movement, have little if any sample size to help describe the odds that will dictate calls to the bullpen, use of deep benches and specific pressure points. Because the National League Central Division has six teams and the American League West has only four, the regular interleague cycles have not produced a meaningful matchup between the Cardinals and Rangers. So, for those fans who believe MLB Interleague play has cheapened the mystique of the Fall Classic, the 2011 World Series is a rare occasion for NLCS and ALCS winners to meet in a relatively exclusive set. Both teams are built to handle games that shake out in either direction from these new duels. The St. Louis Cardinals lineup includes familiar mashers Albert Pujols, Matt Holliday, Lance Berkman and this year’s new promising star David Freese. The Texas Rangers have an MVP anchor in the lineup, too, in the form of Josh Hamilton, and have surrounded him with He-of-the-tape-measure-blast Nelson Cruz, star third baseman / DH Adrian Beltre, mashing catcher Nike Napoli and reliable veterans Ian Kinsler and Michael Young. Just like its midsummer All Star Game, Major League Baseball will enjoy sharing these sluggers with chicks and dudes who continue to “dig the long ball in the new “cleaner” era of play. If capable and proven pitchers on either side buckle under the pressure of these lineups, plenty of bullpen help is available to both squads thanks to midseason trades for the Rangers, who brought in Mike Adams, Mike Gonzalez and Koji Uehara, and the Cardinals, who added relievers Arthur Rhodes, Marc Rzepczynski, and Octavio Dotel, the latter two via the trade of young five-tool player Colby Rasmus who had fallen out of favor with manager Tony LaRussa. This bullpen helped St. Louis weather the offensive storm that was the 2011 Milwaukee Brewers to win the National League Championship Series, with Rzepczynski getting the clinching Game 6 win, so they’ve proven an ability to keep the Cardinals in a game and series. The Rangers charged more purposefully through their two American League playoff opponents; therefore, their lineup has received a little more attention than the Cardinals. St. Louis has battled back from being 10.5 games out of a playoff spot in the last week of August and actually scored more runs on the road this season (412) than the Rangers did (357). This is a balanced matchup of balanced teams, and maybe only the cool Midwestern weather will be able to dampen the heated back and forth of these teams. The Busch Stadium crowds ranked third in attendance this season, so 2011 World Series Game 2 Ticket Prices are likely to reflect consistent heavy demand. Arm yourself for a search on SeatGeek with a few initial pieces of information. The cheapest walk-in tickets, as usual, are Standing Room Only (SRO) ones. For now you can grab one for a little over $200. World Series Game 1 Ticket Prices actually have a few seats that are cheaper than SRO options, but Game 2, possibly the last game at Busch Stadium if things end quickly in Arlington, are in higher demand. SeatGeek’s Deal Score Rating identifies the best deals for World Series Game 2 Ticket Prices in the Scoreboard Patio section, in straightaway center field, starting at $304. 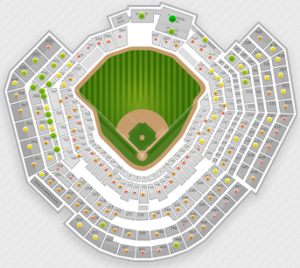 Tickets for that price will also get you spots in the left field corner (sections 269 and 270). 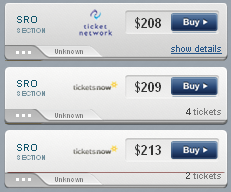 The two most expensive options are located even with first base (section 142, $2,570/ticket) and behind home plate (section 150, $2,228 each). These prime locations also include the benefit of being lower in the stadium and out of the most wind-affected areas, though at quite a premium. Average tickets prices at face value during the regular season to see the Cardinals at home are $46, so the fact that the cheapest ticket is already five times that shows just how exicted folks are in St. Louis. While it may sound like a good idea to seek out SRO tickets in order to keep moving and stay warm, consider securing an actual seat to give yourself a place to rest with a blanket to keep you warm. 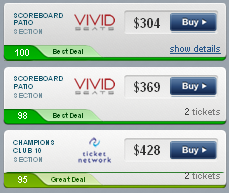 Any questions about 2011 World Series Game 2 Ticket Prices and Deals? Contact us on Twitter @SeatGeek or write chad@seatgeek.com. Enjoy the game!